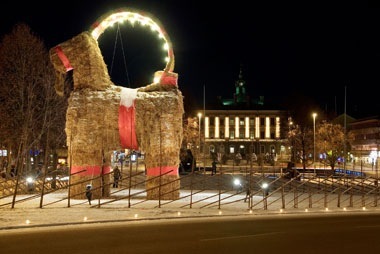 Since the 60’s, in the town of Gävle, north of Stockholm, they have had the Christmas tradition of building a large hay goat in the town centre. Oddly, the goat is a Christmas symbol in Sweden. This ‘Gävle Goat’ has become famous throughout the nation because it has spawned another, less Christmassy tradition. Every year, with few exceptions, the giant goat has been vandalised or set on fire. This year, guards have successfully intercepted several people during the weeks prior to Christmas who had a mission to set the goat aflame. But it survived! This year, the fortunate goat made it to Christmas Eve without being graffitied, singed or doused in any form of flammable liquid. But will it make it to 2015? Or will it go up like a New Year’s firework? Well, that cliffhanger will be resolved in a few days.